The Pavian & Hoek Zinc-Lead Trends are found on Sabre's EPL 3542 (SBR 70%). These two trends each cover more than 25 kilometres of strike and host significant zinc-lead resources. 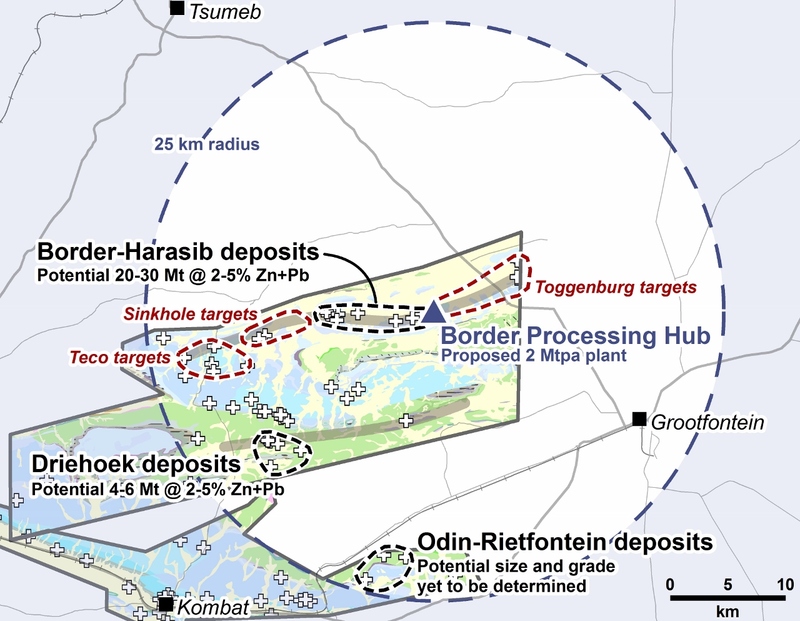 The resources at Border (16.2 Mt @ 2.1% Zn+Pb) on the Pavian Trend, and Driehoek (3-6 Mt @ 2-5% Zn+Pb) on the Hoek Trend, were Sabre's primary driver for the acquisition of the Otavi Mountain Land project in 2007.
areas and target areas. The proposed site of the processing hub is shown at Border in the centre. Exploration and studies of these zinc-lead trends has outlined a number of resources and targets through Sabre's tenement holdings. A recent scoping study focused on the Border deposit indicates that these low grade Zn-Pb deposits may be able to be bought into production through the innovative use of existing technologies given the right economic circumstances. The resources and exploration targets on the Pavian & Hoek Trends are described in detail in the following sections.